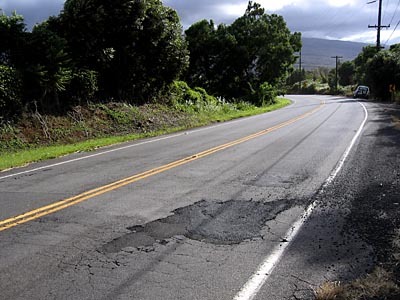 Sure there are lots of potholes around the island but these two potholes between Puu Lani Ranch and Pu`uanahulu Baptist Church in the south-bound lane have got to be two of the worst on the island. Like a pair of evil twins next to each other. Sure there are deeper, bigger ones like the potholes at the Old Kona Airport that could double as a practice area for NASA lunar landings. Or some roads in Waimea where it looks like some exploded minefield, but this one is dangerous. These two potholes have been filled (I presume by road crews) but have sunk again. It’s not so much that they are deep but they are just in the right place of the turn where you feel like your steering has lost control for a split-seconds while driving over them. I drive slower than normal in this area since I know it’s there but for the unsuspecting I bet it’s unsettling. 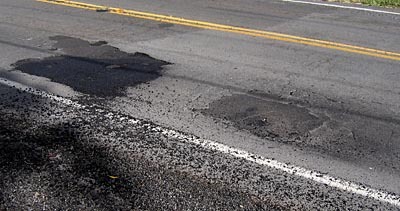 Any other whoppers of potholes out there on the Big Island?